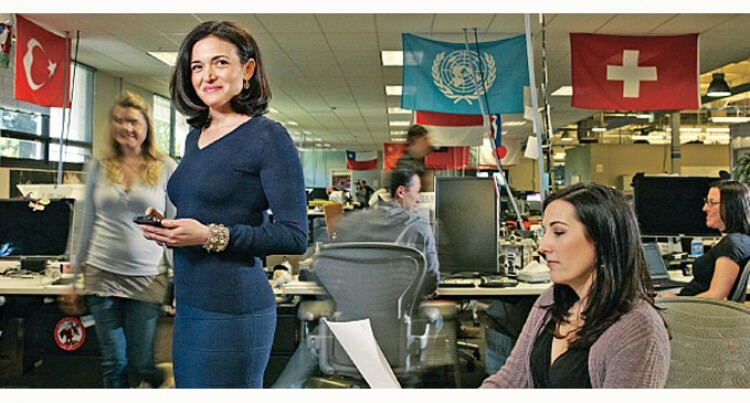 Chief operating officer of Facebook, Sheryl Sandberg (left). The more I travel the more I notice how much of a role women play in our society. In particular in Europe and America women are at the forefront of many private and public sector businesses and are also leaders of Governments and non-governmental organisations. Over the next few weeks we will look at a few of these very successful individuals who have climbed the ladder to the top of their organisation. These visionaries have led from the front and today are shining beacons of hope for all aspiring women that anything is possible as long as you are committed, hard working and willing to make the sacrifices. This week we look at a person who impacts most of our lives on a daily basis. Maybe without this person’s company implementing their social media presence we might not have connectivity to our friends and family in all four corners of the globe. This social media icon is of course Facebook and the chief operating officer of the company is Sheryl Sandberg. Sheryl Kara Sandberg was born in August 1969 to a Jewish family in the capital of America, Washington D.C. Her father was an Ophthalmologist and mother worked as a teacher specialising in the French language. From an early age she learned from her parents the importance of education and also family. These life lessons Sheryl learned were to set her path towards becoming one of the most powerful women in the world today. At a young age she moved with her family to Miami, Florida where she attended North Miami Beach High School, it was here that she excelled in her studies regularly topping the class. In addition to her studies Sheryl also had a passion for Aerobics and taught classes for a little bit of extra income during her holidays. In 1987 at the age of 18 years she enrolled in Harvard College after receiving excellent results in her studies, it was here that she was made aware of the business side of the world and took a keen interest in the corporate business and practices. While at Harvard College she was recruited by the World Bank for one year to assist in research for projects on Leprosy and Blindness in the developing world. This pricked her social conscience and made her aware of the suffering that many people have throughout the globe with many illnesses and ailments. After graduating from Harvard College Sheryl quickly moved up the corporate ladder and in 2001 she joined Google as its online sales director. She served in this position for seven years before meeting Facebook’s CEO Mark Zuckerberg. The two quickly forged a very good relationship and in March 2008 she was appointed as chief operating officer for the Facebook Group. As part of the payment package Sheryl took stocks in the company and once Facebook was listed she sold 50 per cent of her shares for a handsome profit. At the relatively young age of 45 Sheryl Sandberg has now emerged as one of the most influential people globally, she has a net value of over three billion dollars, sits on various boards such as Walt Disney Starbucks etc and in 2013 launched her book “Lean In” which is a best seller. In addition to this she is a wife to David Goldberg and they have two young children together. Maybe one of the most noble things that Sheryl has undertaken is to pledge to give a minimum of 50 per cent of her income to charity. At present this amount to over one billion five hundred million dollars that she will disperse to a host of good causes. I am sure you will agree that we all encourage her to be even more successful so that for every dollar she earns 50 per cent will be given to help the poor and disadvantaged in life.